LightSquared has its first satellite in the air, SkyTerra 1, enabling national coverage almost instantly - though it will need a ground component before it can make any money. SkyTerra 1 was launched yesterday from the Baikonur Cosmodrome, Kazakhstan, packed with a Breeze M motor atop a ILS Proton rocket. The Proton delivered the package into orbit, and the Breeze M then delivered the 5.3-tonne satellite into geostationary orbit from where it will be able to provide national phone coverage across the USA, though LightSquared will be hoping the vast majority of calls never make it more than 20m from the ground. 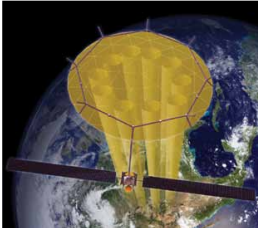 The Sky Terra 1 satellite has a massive reflector, 22 metres across, enabling it to deliver mobile connections topping 400Kb/sec to handsets across the USA using the L-Band (around 1.6GHz), and it's that frequency that LightSquared really wanted. LightSquared's business model is to own satellite frequencies, but use them to connect over a traditional ground-based network which is much cheaper to operate. Such ground-based networks are supposed to fill in the gaps in satellite coverage; indoors and between tall buildings, but LightSquared has (with the FCC's approval) turned that model on its head. The company was obliged by the frequency licence to launch at least one satellite, but Sky Terra 1 will be filling gaps in a ground-based network rather than the other way around. That ground-based network will be built by Nokia Siemens, but LightSquared still needs to raise an awful lot more money before it can pay for that. With a bird in the air LightSquared could start offering a purely-satellite service, though from geostationary orbit there's a noticeable latency and the cost of calls would need to be very high. Daily Wireless has a good rundown of the competing satellite systems that seem to be proliferating at the moment.